GOVERNMENT says it will follow up on South African telecoms giants Telkom and MTN's inquiry into the sale of NetOne by offering a joint package of the mobile network operator and its sister telephone and internet service provider, TelOne. According to Finance Minister Mthuli Ncube, government will be merging the entities under a Special Purpose Vehicle (SPV) as it moves to partially privatise the two parastatals which are burdened by legacy debts and losses of more than $100 million. He was speaking at Tuesday's post cabinet media briefing in Harare where he revealed that government was considering discarding 60 percent of the merged venture. "We are aware of this (Telkom and MTN interest) but we are saying that government will get better value for money if these are floated together as a package. "We will approach them by the way to let them know, they have a much bigger asset to compete for in the form of the two assets together as opposed to a TelOne or NetOne as was the case before. "Now that we have got both fixed telephony and mobile telephony in terms of NetOne and TelOne, you would need suitors who can adequately handle those two aspects of telephony," said Ncube who revealed that there were already other potential investors. "We do realise that the two companies, that is NetOne and TelOne are joined at the hip since they rely on each other and in a sense, if that was considered, they will be well positioned to compete with competitors such as Econet in the market." 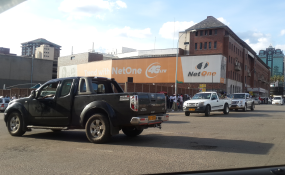 Price Waterhouse Coopers (PWC Zimbabwe) are current transaction advisors for TelOne and government will be engaging them to advise NetOne on the proposed sale, according to Ncube. Negotiations between possible investors and government are set to be complete by September this year. Last year, government gave NetOne authority to engage Telkom in negotiations for partial takeover. NetOne is Zimbabwe's second largest mobile phone operator in terms of subscriber base at 5 million subscribers after Econet Wireless. TelOne is a member of the EASSY submarine cable through the west Indian cable company consortium. Its main business is voice which accounts for 54 percent of the market share and has about 258,000 voice subscribers. Ncube added, "In terms of performance, we know that it could do better. In 2017, it made a loss of about $11.8 million... we should also know that the company is saddled by legacy debts of about $384 million. In 2010, MTN also expressed interest in acquiring the mobile phone operator which has now incorporated mobile money and internet services. However, negotiations fell through due to the Indigenisation Act.